Below you will find a list of discussions in the Member News Depot forums at the Galaxy Nexus Forum - Samsung Galaxy Nexus Community. 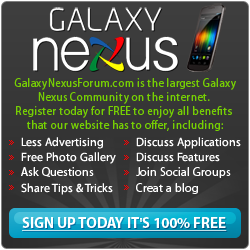 The Member News Depot forum is for discussion of: Discuss all the current Galaxy Nexus News and Events. Found something interesting, then post it here!. How do I get pictures that were attached to a message off my Nexus to my computer? Got the Official Jelly Bean OTA!! !